Dan Donohue as Richard III. Photo courtesy Oregon Shakespeare Festival. When last we saw Dan Donohue, it was as an extraordinarily deep and well-developed Prince of Denmark in OSF’s 2010 production of Hamlet. Four years later, he has returned to headline this year’s headline play: A complex, modern interpretation of Richard III, Shakespeare’s last and most famous History. 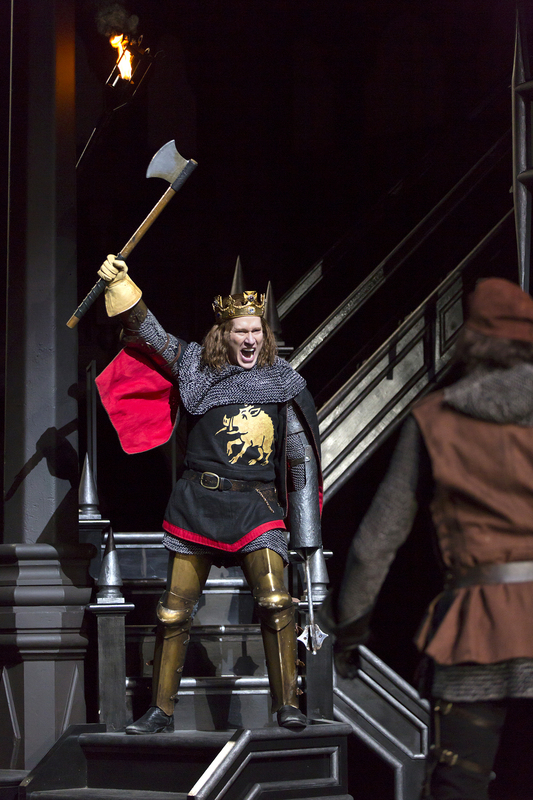 Donohue’s interpretation of Richard III, if not sympathetic, is certainly understandable. Up until he orders the assassination of children, it seems like all of his actions are calculated to win him the English throne. His actions are not committed with greater malice than can be expected from a relatively ambitious man in his position. This interpretation makes his subsequent descent into madness and death vivid and more intriguing to the audience. Audiences who are familiar with the cackling force of evil from other versions of Richard III will find the OSF version a breath of fresh air, though there is something for audiences at all levels of Shakespearean experience. By employing modern sensibilities in a realistic interpretation of Shakespeare, OSF seeks to capture a greater audience while staying true to its theatrical goals.